This work proves how effective the combined application of numerical tools based on dispersion models and oceanographic and historical research is in finding underwater archaeological remains. Piecing together what happened when the Fougueux sank has not been easy. Belonging to the French navy the Fougueux was a 74-gun ship of the line which sunked after the Battle of Trafalgar in 1805, in the Camposoto area due to rough weather following the bloody naval combat. After surrendering its flag, the Fougueux was captured and towed by the English enemies. However, a strong storm left it adrift. With no direction, it ran aground near to the Sancti Petri Castle where, according to the hypothesis supported by a group of researchers from the University of Cadiz, led by professor Manuel Bethencourt, it broke up and the Fougueux’ remains were scattered and transported by the storm towards the coast where they they have remained until today. For years, the Andalusian Centre for Underwater Archaeology (CAS) has undertaken the arduous task of researching the remains from this ship in Bajo de Las Morenas and other wrecks in the Bay of Cadiz area. In relation to the Fougueux, “the CAS has provided a rich description in several works of an archaeological site where 32 of the 74 cannons have been found as well as one of five or six anchors which are usually present in this type of ship”. This led to the obvious question, “where was the rest of the ship?” comments Bethencourt, professor at the University of Cadiz and co-author of the article ‘Scattered shipwreck site prospection: the combined use of numerical modelling and documentary research’ (Fougueux, 1805) with teacher Alfredo Izquierdo and Tomás Fernández Montblanc. This article brings all this work together, along with other publications included in the National R&D&i Plan ARQUEMONITOR CTM2010-16363. The University of Cadiz started to work on the body of documents regarding the Battle of Trafalgar (compilation of historical documentation from logbooks, watch towers, ground regiments…), with the knowledge that the Fougueux sank around the 21st October 1805. “We analysed what happened in the Camposoto area from 21st October onwards; the existing information talked about three possible shipwrecked vessels in the area: Fougueux, Montblanc and Agile. However, the Montblanc was captured by the English in open sea on 4th November and the Agile, which initially ran aground in the Torregorda area, freed itself only to sink in the mouth of the San Pedro River on 25th October. Therefore, we can deduce that amongthe three ships, the only one which could have broken up on the morning of 25th October in Camposoto was the Fougueux and not the Montblanc, as recorded by the lookout of the Tavira Tower”, explains the researcher. This information was key for developing the investigation. The Battle of Trafalgar took place on 21st October 1805 and early the next day, a fierce storm arrived that affected the Gulf of Cadiz for eight days, being especially aggressive at the Atlantic ledge of the province of Cadiz. “It was very rare weather, one of those storms which come about only one in several hundred years. Except for one vessel which was sunk during the battle, the rest of the vessels shipwrecked were a consequence of the weather that exploited the boats’ weak control. The storm started with a southern wind which changed to a northern wind. During those days the weather was changing the swell conditions, the current, etc. We were interested in how the storm progressed because we needed to simulate these conditions to find out where the ship remains could have gone”, explains Manuel Bethencourt. In December 2009, Cadiz experienced a similar storm, and this time the data was registered perfectly. “We now had three points to work from: the work of meteorologist Wheeler, which reconstructed the weather characteristics of those days after the battle; the logbook information and other historical documents; and this information led as find a storm evolved in a similar way such as that happened on Dec 2009, which evolved in a similar way. We also relied upon the area’s physical characteristics, based on studies carried out as part of the ARQUEOMONITOR project as well as oceanographic and meteorological information from the pre-operational oceanography OceansMAP-UCa system, developed and maintained by the “Physical Oceanography: Dynamic” group: from the University of Cadiz”. All of this, along with bathymetric information from the area that existed at that time, led the researchers to “launch virtual particles which would make the objects drift as they did in that area at the time of the shipwreck, a mathematical lagrangian dispersion model feed with model output of coastal circulation model coupled with wave model -. We carried out several simulations in order to define the maximum area of probability for localising these particles, which in our case were the ship’s remains”. In a geomagnetic and bathymetric survey of the most probable area, four groups of archaeological remains including 40 guns and 5 anchors similar to those previously found in the Bajo de las Morenas area, were found a certain distance from the beach. According to the hypothesis of the researchers, these were the remains that were still to be found from the Fougueux, about two thirds of the vessel. This hypothesis is supported by the chemical and metallographic elements of a little fragment of copper which appeared in one of these findings, identical to the copper covers used to protect the hull of the vessel from Teredo navalis (naval shipworm) and which has been found in the previous remains of the Fougueux. The mathematical-physics perspective which Tomás Fernández Montblanc used, helped them design a map to show where the remains of the Fougueux had more probability in being found. With this “we have proved that applying numerical tools based on hydrodynamic and dispersion models are very effective”. 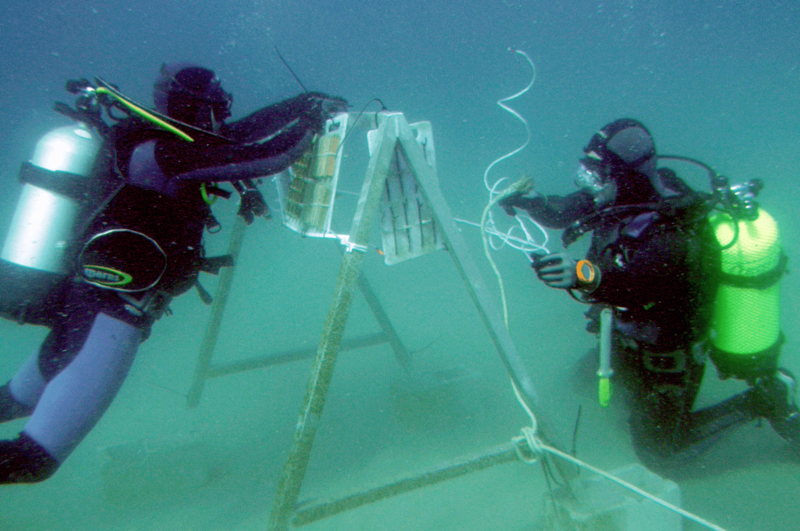 Moreover, it is not restricted to being used in finding underwater archaeological remains since “this model can be employed, for example, to estimate the dispersion of an oil leak from a ship or be used when there has been an oil spill, to localise a corpse after a shipwreck…”, explains the UCA professor. Tomás Fernández Montblanc has improved this model “making it easier to apply this method to other environments”. The work of this research team has had much wider ramifications and has been carried out within the ARQUEOMONITOR project financed by the Ministry of Economy and Competitiveness. Its main aim is to know how underwater archaeological sites evolve in terms of their materials and the physical, chemical and biological conditions of the environment.